Apple's Phil Schiller announced Wednesday at Apple's "Gather Round" event in Cupertino that iOS 12 will be available to download on Sept. 17. The announcement came after Tim Cook announced that Apple will soon ship its 2 billionth iOS device. The new iPhone Xs, Xs Max and XR will ship with iOS 12, and it will be available to download on that date. iPhone Xs and iPhone Xs Max, Apple announced, will be available for pre-order beginning September 14 and in stores beginning Friday, September 21, while the iPhone XR will be available for pre-order October 19 and in stores October 26. 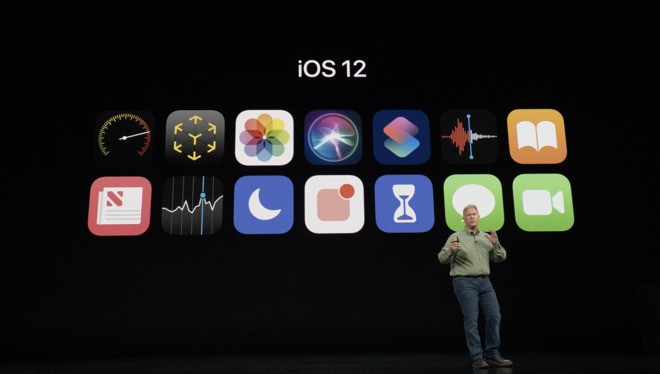 New features on iOS 12, which was introduced at WWDC in June, include Siri Shortcuts, Life Balance and Screen Time, Animojis, updated group notifications, and other new features. Group FaceTime, which was announced in June, will not be available at launch, due to delays.